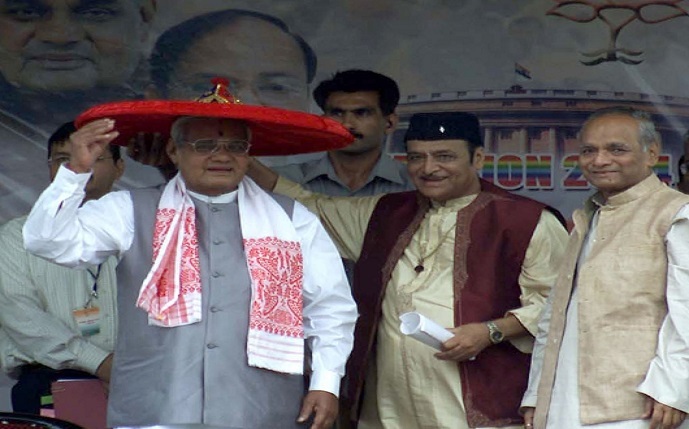 File photo of Atal Bihari Vajpayee, the then Prime Minister of India being felicitated with the Assamese traditional "Gamosa" and "Japi" by Dr Bhupen Hazarika, BJP candidate from Guwahati LS Constituency during the first election campaigning meeting of BJP in Guwahati,on 6-04-04. UB Photos. Bharatiya Janata Party, Manipur Pradesh, organized a condolence meeting on the sad demise of former Prime Minister Atal Bihari Vajpajyee at the party’s state head office at Keishampat in Imphal on Friday. Bharat Ratna Vajpayee passed away on Thursday. He was 93. Paying floral tribute to the photograph of Vajpayee party’s national executive member Meinam Bhorot shared the great leader’s visit to the state and his unforgettable moment with him in the eighties. A two-minute silence was also observed to show respect to the departed soul. State social welfare minister Nemcha Kipgen, MLA Dr Y Radheshyam, party’s key functionary including former speaker Dr Haobam Borababu, Sh Shantikumar, Dr RK Ranjan and other party office-bearers also attended condolence meeting. Manipur Chief Minister N Biren Singh has deeply condoled the sad demise of former Prime Minister Atal Bihari Vajpayee. In his condolence message, the chief minister said that Vajpayee was one of the leading and longstanding politicians of the country, who had left a mark of his own during his long public life. A statesman and towering figure in Indian politics, Vajpayee was a Member of Parliament for over four decades – 10 times in the Lok Sabha and twice in the Rajya Sabha, he said. Vajpayee was one of the founders of the Bharatiya Janata Party in 1980. He became the Prime Minister of the country three times as well, he added. In a condolence message, state forest minister Th Shyamkumar said that Atal Bihari Vajpayee was a great human being, orator, poet, a leader par excellence and a visionary statesman. His death has created a vacuum in the political circle of the country. “The BJP is saddened by the sudden demise of the late veteran politician and deems of the demise Atalji as a great loss for the country,” N Nimbus Singh, state BJP general secretary said in his condolence message. Lok Jana Sakti party Manipur unit also organized a condolence meeting with its state leaders including consumer affairs and food & public distribution minister Karam Shyam in the chair. The Janata Dal (U) state unit also held a similar condolence meeting at its office in Imphal. Former Rajya Sabha MP BD Behring and others also condoled the sudden demise of former PM Atal Bihari Vajpajyee.